Mystery Science Theater 3000 ran for ten years, taking some of the worst B-movies made and having a laugh with them. The series showcased a number of films, like Alien From LA, that missed the mark of being good by a wide margin. Yet, some of the featured movies had a nugget of a good idea. It was the execution of the idea that had problems. Space Mutiny is one of those movies. 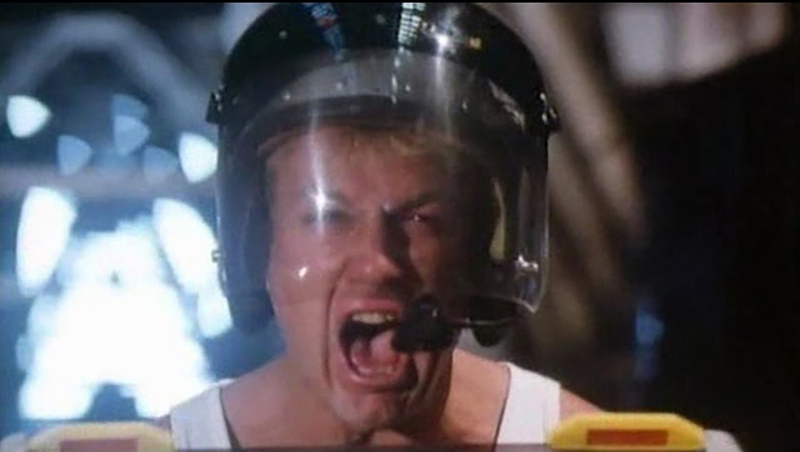 Released in 1988, Space Mutiny starred Reb Brown as David Ryder, Cisse Cameron as Dr. Lea Jensen, and John Philip Law as Elijah Kalgan, and featured special effects by John Dykstra. Said special effects came from the original Battlestar Galactica, but let’s not quibble. South Africa wasn’t known for being a source of masterful special effects. The plot of the movie, well, that’s where the problems start. The movie is disjointed, with multiple elements seemingly tacked on. There is a spaceship, the Southern Sun, played by the Battlestar Galactica, whose mission was to find a new home for the generations of colonists on board. Several generations have lived their lives on board the Southern Sun without ever having set foot on a planet. A new planet, though, is near. So are space pirates, in league with Kalgon, who wants the colonists to settle on the planet. Kalgon has the Enforcers, the ship’s security/police detail, under his control. He doesn’t have the ship’s flight crew, including Ryder, under his influence. However, a pirate attack featuring Cylon Raiders reduces the number of Starvipers, played by Colonial Vipers, and forces Ryder to make a hasty landing on the Southern Sun‘s landing bay. Sabotage causes the Starviper to crash. Ryder escapes the exploding ship through a short-range transporter, though his passenger, an important professor who never gets mentioned afterwards, perishes. Ryder teams up with Dr. Jensen and discover the mutiny. Ryder rallies the rest of the ship’s crew to take the fight to the mutineers, leading to the engineering section being the main battlefield. The mutiny is put down, the space pirates’ main ships, played by Cylon Basestars, are destroyed, and the colonists are free to land on the planet. Or not. This doesn’t include the subplot with the Bellerians, a sect of women-only monks who arrived by Galactica shuttle prior to the first pirate attack. The Bellerians added a mystic element, though only to convince Commander Alex Jansen, played by Cameron Mitchell, to let people on the discovered planet, maybe? The disjointed nature of the plot wasn’t the only problem. Continuity errors popped up. Pity poor Lieutenant Lemont, played by Billy Secord, who can’t even call in dead for her shift. 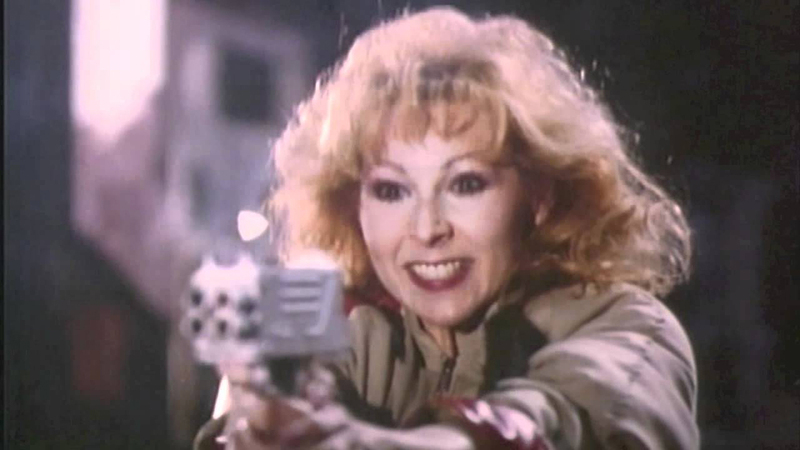 Lemont was shot dead in one scene, but is shown later arriving on the bridge to start her shift. That would be a great reason to mutiny on its own. The Southern Sun‘s engineering section is an industrial power plant, with brick walls. Proper set dressing might have hid the inconsistencies, but someone should have at least noticed the windows and blocked the shot to avoid having them in frame. The low budget comes up in other places. A computer used to verify Ryder’s identity card is clearly an 386 clone complete with a 5-1/4″ floppy drive. To the crew’s credit, that floppy drive worked as the card scanner, but only for audiences not familiar with the device. The carts used by the Enforcers were modified golf carts; the added mass to make the vehicles look futuristic affected performance, so the “high speed” chases weren’t impressive. The reuse of Battlestar Galactica shots leads to questions like, “Why are both landing bays out if the explosion happened in just one?” It’s not like the other landing bay is being used as a museum. With the problems out in the open, what can be done to remake Space Mutiny so that it isn’t a mess? As seems to be the case with anything featured on MST3K, the core issue is budget. The crew did what they could with what they had, from using an industrial plant for the engineering section to using a corporate office for the bridge. The use of the industrial plant meant that the Southern Sun was one of the few movie starships that was OHSA compliant, with railings to prevent people from falling to their deaths. Sure, that instead led to people dying and falling over the rails, or “railing kills” as Mike and the Bots put it, but that added some visual drama, if overdone at times. With a proper budget, the next step is to get proper special effects instead of putting the Galactica in reverse. Give the Southern Sun its own look. Make it a proper generation ship, not a repurposed warship. Sure, have a starfighter squadron there, but the goal is that the ship isn’t military. The remake should have its own look, if for nothing else the ability to license the designs to model kit companies. While getting the special effects worked out, next to be tackled is the plot. The big problem with the mutiny is that the mutineers have a point. There’s a planet. The mutineers and their ancestors have been on board the Southern Sun for lifetimes without ever having set foot on a planet. What is the harm of letting off colonists who want to settle on this planet instead of the Southern Sun‘s intended destination. After several generations, there should be more than enough colonists to settle both worlds. It’s not like space travel doesn’t exist, even if it takes time. The mutiny could have been ended before it began if both sides sat down to negotiate. There’s no indication in the movie that anyone even tried that. If the mutineers are meant to be the villains, then they need to be shown as villainous beyond breaking “the law of universe”. If the space pirates are to be kept and the mutineers are to be in league with them, then a different motive needs to be found. Instead of wanting to settle on the planet, have the mutineers sell the colonists to the pirates. A ship full of humans willing to toil on a new planet must be worth something to some alien trader who doesn’t care if humanity is sapient. The colony ship – it doesn’t have to be a generation ship now, just far from home – is ripe for the taking. The colonists want to settle on the planet below. Turning the generation ship into a colony ship fixes a few other problems, such as if this is as far as humanity has gotten, where did the pirates and the Bellerians come from? Now, instead of being lifetimes away from the start point, it’s just a matter of months or years. Have a crewmember or two mention previous colonies that have disappeared without a trace over the past few years to add some foreshadowing. This also ensures that the audience’s sympathies are with the colonists, not the mutineers. After the plot is cleaned up, figure out what to do with the Bellerians. They were a last minute addition to pad /Space Mutiny/ out long enough to be released in theatres. Do they add to the story? Can they? Assuming that they can be worked into the narrative, it’s easier to have them already on board, separate from both crew and colonists, heading to start a new monastery on the planet being colonized. Define what they can and can’t do early, and decide if the mysticism is needed. The Bellerians should add to the narrative, not be a sidebar. Costuming needs to be updated. Some of the costumes, mostly worn by women, date the movie to the mid- to late-80s. Blue bodysuits, while having the advantage of being visually attractive for the make gaze, don’t portray a sense of military discipline. Of course, if the ship is being used for colonial operations, it may not even be military. Given Public-Private Partnerships even today, a government colonization effort with private contractors isn’t that far-fetched, and may give a little extra motive to the mutineers. This may mean that the uniform worn by crewmembers are stylish while still being functional for being onboard a spaceship, with the wearer being able to get into a spacesuit during an emergency. The colonists can then be easily distinguished by not wearing a uniform. Sets are the last hurdle to get over. Space Mutiny tried to use an existing industrial plant to get past some of the need in building the engineering section. This got the movie the machinery needed plus interesting ground to stage a laser battle and chases, but also brought in brick walls and windows. CGI could be used to replace some of the problems, but creating a background that looked like a spaceship’s engineering section, completely with drives, but practical effects allow for the actors to interact with the set more believably. Unlike, say, the Death Star in Star Wars, the Southern Sun had protective railings to keep engineering crew from plummeting to their deaths by accident. It’s a touch that needs to be kept, even if to have a few railing kills. A few, not everyone shot in engineering. Finally, continuity. Unless the Bellerians have the ability to bring the dead back to life, let Lt. Lemont stay dead. Let her have her time off. Make sure that the remake flows to the end, without sudden trips that pull the audience out of the story. The scale of the story needs to make sense. The original implied that there was a galactic and even universal tribunal creating laws, except the Southern Sun was far from its home. Set expectations early. 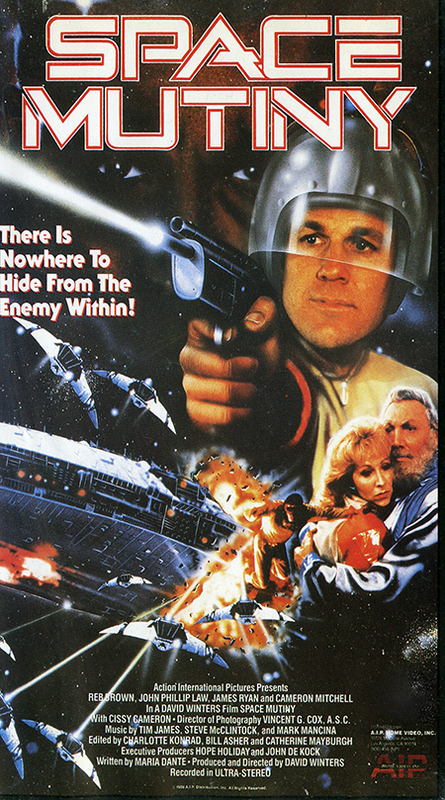 Space Mutiny, like many films featured on Mystery Science Theater 3000, had problems with execution. The movie, though, has the germ of a good movie, just waiting to be coaxed out.